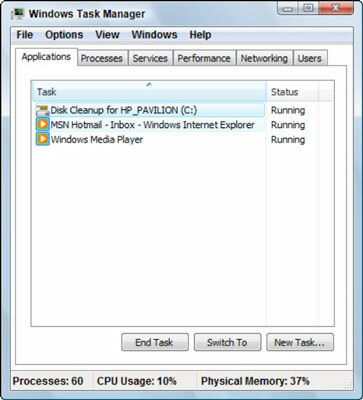 Learning how to shut down a non-responsive application in Windows Vista can save you from a lot of headaches. Nothing is more frustrating than waiting forever for your computer when it has locked up. Usually, the problem stems from one application that is confused. By shutting down the non-responsive program, you can free up Windows Vista to not only start working again but to look for solutions to your problem. The screen should change back to what looks like your login screen, except that it has new options. If pressing Ctrl+Alt+Del doesn’t bring up the Task Manager, you’re in bigger trouble than you thought. You might need to press and hold your computer power button to shut down. Click Start Task Manager and then select the application that stopped responding. This won’t be hard to find. The words Not Responding will appear in the Status column. If several applications have the same status, choose the one you were working in when the problems started. Click the End Task button. A message box will appear telling you that the application isn’t responding and asking whether you want to shut it down now or wait for it to start working. This will cause the program to close; you will lose any unsaved work in that application. Some applications use an AutoSave feature that keeps an interim version of the document that you were working in — you might be able to save some of your work by opening that last-saved version. Other programs don’t have such a safety net, and you simply lose whatever changes you made to your document since the last time you saved it. The moral? Save, and save often. You may see a dialog box appear when an application shuts down that asks if you want to report the problem to Microsoft. In the past, if you said yes, information went to Microsoft and that’s the last you heard of it. In Windows Vista, if you have an Internet connection, you actually get a message back with suggestions on how to solve the problem. This message appears in a little window on your screen.